Democratisation of data science, i.e. making shorter the cognitive distance between the domain expert and the data scientist and automation of workflow pipelines.. 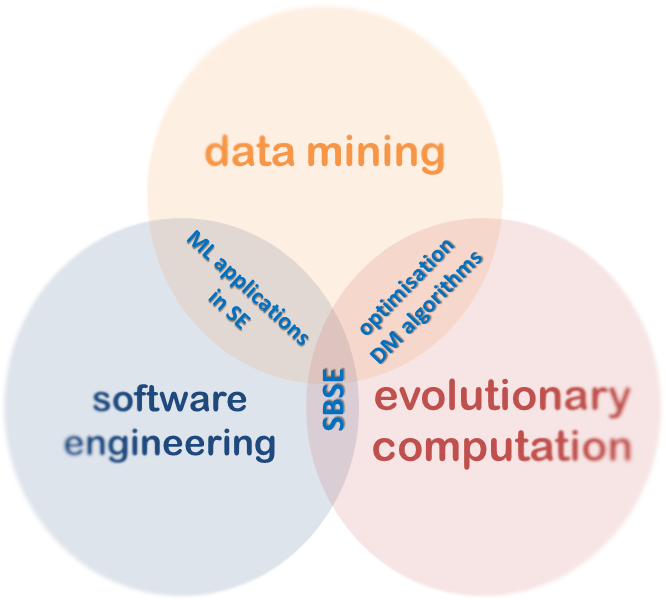 Application of bioinspired algorithms to complex data mining tasks, i.e. optimisation of these tasks when regular algorithms cannot deal with large data or reach optimal results. Search-based software engineering, i.e. optimisation of tasks of the software development lifecycle (project planning, requirements, analysis, services deployment, refactoring, etc. ), use of diverse metaheuristics to address complex software engineering problems. Mining software repositories, i.e. automatic exploration of software repositories (e.g. git), developer forums and communication tools (e.g. slack, StackOverflow) and technical documents to discover potential risks, measure current projects, predict errors or recommend good practices for future developments. Use of model-driven software engineering (MDE) techniques, and design/development of (visual) domain specific languages (DSML) and its applications. MEyC Project TIN2017-83445-P. EMERalD: EMERging trends in Data analysis. 01/01/2018 - 31/12/2020. MEyC Project TIN2014-55252-P. Mining data with more flexible representation. 01/01/2015 - 31/12/2017. MCI Project TIN2011-22408. New problems in knowledge discovery: A genetic programming approach. 01/01/2012 - 31/12/2014. MCI Project TIN2011-15009-E. Scientific research network on technologies for the industrial development of software (Red telemática en tecnologías para el desarrollo industrial de software). 20/01/2012 - 20/01/2013. JA Project P08-TIC-3720. Applications of techniques for knowledge extraction in educational systems (ATECSE: Aplicaciones de Técnicas de Extracción de Conocimiento en los Sistemas Educativos.). 01/01/2009 - 31/12/2012. MCI Project TIN2008-06681-C06-03. Current trends and new challenges in KEEL. Multi-instance learning and evolutionary neural networks, educational data mining and Web mining (Tendencias actuales y nuevos retos en KEEL. Aprendizaje multi-instancia, redes neuronales evolutivas, minería de datos educativos y minería Web.). 1/01/2009 - 31/12/2011. JA Project P07-TIC-3184. Modernization and visualization of complex information systems (MOVIS: Modernización y visualización de sistemas de información complejos). 01/01/2008 - 31/12/2011. MEC Project TIN2006-26882-E. Scientific research network on Maude (Red de Maude). 1/1/2007 - 1/1/2009. MEC Project TIN2006-27690-E. Scientific research network on product lines (Red de Líneas de Producto, ELE.PE.S). 1/12/2006 - 1/12/2008. MEC Project TIN2008-00889-E. Scientific research network on Model-Driven Engineering (Red de Desarrollo de software dirigido por modelos, DSDM). 1/11/2008 - 1/11/2010. MEC Project TIN2005-09405-C02-01. Software development for distributed P2P systems (Desarrollo de software para sistemas distribuidos P2P). 1/1/2006 - 31/12/2008. MEC Project TIN2005-25886-E. Scientific research network on Model-Driven Engineering (Red de Desarrollo de software dirigido por modelos, DSDM). 6/7/2006 - 6/1/2008. MEC Project TIN2005-24055-E. Scientific research network on product and software process quality (Calidad del Producto y Proceso Software). 1/1/2006 - 31/12/2008. MEC Project TIC2002-04309-C02-02. Methodologies and tools for the component-based and aspect-based software develpment (Metodologías y herramientas para el desarrollo de software basado en Componentes y Aspectos). 1/1/2003 - 31/12/2005.